1. Antioxidant Power Punch: Potatoes are packed full of powerful nutrients and antioxidants, which help fight free radicals. A medium baked potato has an ORAC value of 1, 680 (measure of total antioxidants in 100 grams), while carrots have only 317 when cooked, or 666 raw. For maximum benefits, enjoy the potato with the skin on. 2. Potassium Packed: While most people think of bananas as the best potassium source, a regular baked potato actually contains more than twice as much, supplying 20 percent of your daily requirement. To get the most potassium out of your potato, refrain from cubing and boiling it, which can cut the potassium by 75 percent. Instead, bake it with the skin on. 3. Beta-Carotene Benefits: The orange color of a sweet potato comes from beta-carotene, a nutrient that encourages our healthy cells to “talk” with one another. This “conversation” inhibits cancer cells from growing because it doesn’t allow the cancer cells to communicate. 4. Bone Health: Healthy bones benefit from a diverse diet, rich in a variety of nutrients, especially manganese. Both sweet and regular potatoes are an excellent source of this mineral. When baked with the skin on, a sweet potato provides 32 percent of your daily needs and a regular one 22 percent. 5. 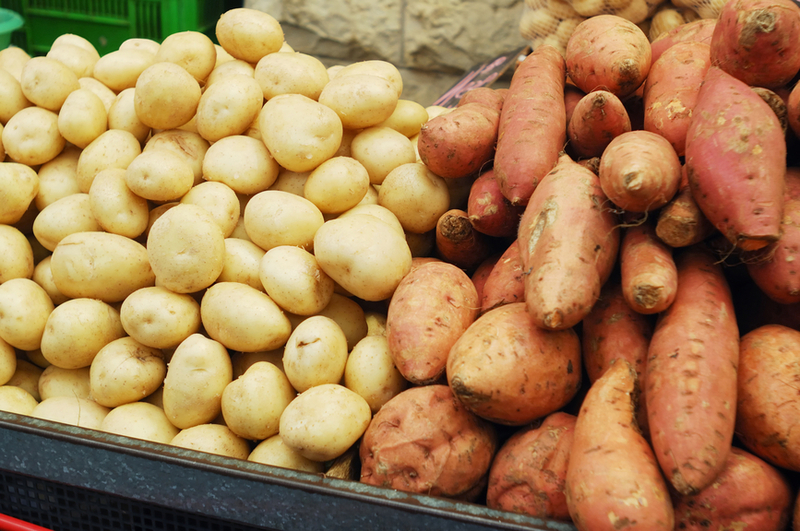 Encourage Enzymes: Regular and sweet potatoes are an excellent source of Vitamin B6. This vitamin is needed for more than 100 enzymic reactions, including creating red blood cells and other chemicals in our nervous system. 6. Vitamin Variety: A white potato provides high levels of folate, a B vitamin that helps maintain heart and brain health. It also contains a lot of phosphorus, keeping your bones strong. Sweet potatoes are all about your immune system, with half your daily Vitamin C requirement and a healthy portion of Vitamin A. If you normally enjoy your potatoes fried or buried under a layer of marshmallows, you’re denying your body the superpower that this vegetable possesses. Whether you choose regular white potatoes or sweet potatoes, they both provide some incredible benefits when properly prepared. Keeping the skin on and baking them is the best way to go. While both contain nearly the same amount of calories, fat, carbohydrates, and proteins, sweet potatoes also contain more sodium and sugars. However, sweet potatoes also contain more fiber, which help you feel full longer. And although both types of potatoes get a bad rap for containing more carbs than most other veggies, a 100 gram serving of either type of potato is only about 7% of your recommended daily carbohydrate value. Plan a meal tonight with the proper serving of potatoes and unearth the health benefits of this versatile vegetable.